A Long Island man was arrested for shoving a 12-year-old boy to the ground after he caught the child recording his wife on a cellphone. Anderson then calls the woman a 'low life' seconds before a man charges at him shoving the boy to the ground. 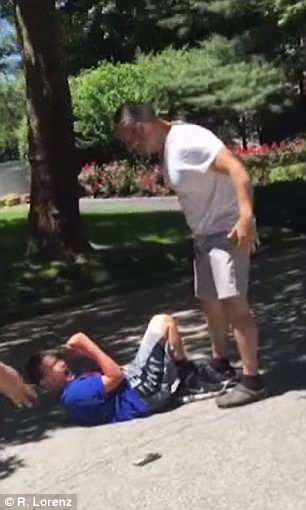 The man curses and smashes Anderson's cellphone on the ground as the boy yells for help. Anderson's father, Christian, called Conte a 'coward' but residents in the area are sticking up for him. According to neighbor Michael Shain, who lives across the street from where the incident happened, the kids were allegedly trying to throw a dead snake into the woman's car with her two kids inside. Christian, however, says there is never a reason for an adult to put their hands on a child. 'Even if they throw a rock at the car, it doesn't justify beating up a child. It just doesn't,' he said. The shoving was just fine. The kid is really lucky. Shoving isn’t beating up. Not even close. Imo, it’s the father that needs the beating. I can’t imagine living in a neighborhood where you can be held up and accosted in the street by 12 year old’s on bikes. It’s surreal...if I had tried something like that in my youth the woman would have gotten out of her car and dragged my home to my parents by the ear where I’d be in for a justified beating. People have died from having rocks thrown at their car. Would it finally be OK with her to mention to a kid who killed someone that throwing rocks is a bad thing? Or would that, in her learned opinion, be too harsh? This will NOT be the last time Alex Anderson will appear in the papers. Never ever have witnesses when striking a kid. Maybe, with the “father” he’s blessed with, it’s doubtful he’s learned anything, but perhaps he’ll smarten up anyway. A takes a Real Man to shove a 12 year old child. I suspect William Conte will experience similar actions when in the lock-up. Good plan. Soon that won’t be possible in a land of a zillion cameras. Considering this article lists a case where it would be justified then that is just an insane statement. So the man can’t protect his own wife and children because the offender is child? Like I said- Insanity. Christian [Christian Anderson? ], however, says there is never a reason for an adult to put their hands on a child. ‘Even if they throw a rock at the car, it doesn’t justify beating up a child. It just doesn’t,’ he said. OK buddy I’d give you one chance to discipline your little thug then I’d clean your clock. I’m sure you’re right. It’s a shameful waste too, not only his parents but I’m sure the school as well has led him down a path to failure. What exactly does having “rocks thrown at their car” have to do with this alleged incident? Decades ago I had to deal with shithead kids running their dirtbikes up and down the street. Got my bat and went and stood in the middle of the street. They peered out at me and decided that was it. No parents came to complain. I was a lot more young a friskier then. Dunno quite what I would have done if one of the little bastards had taken another run. Sometimes that man is called a parent. You do know that part of a parent's job is to teach feral animals to be responsible adults, don't you? Sometimes you first have to get their full undivided attention. It's not pretty, but it's a LOT prettier than waiting until they become something that's earned a jury of 12 of their peers and a long incarceration, or worse. Throwing a rock at a moving vehicle is a felony, I believe. I would support shooting the boy to death.